The Maps of the Wilderness: An Atlas of the Wilderness Campaign, May 2-7, 1864 continues Bradley M. Gottfried’s efforts to study and illustrate the major campaigns of the Civil War’s Eastern Theater. This is his fifth book in the ongoing Savas Beatie Military Atlas Series. The previous four were The Maps of Gettysburg (2007), The Maps of First Bull Run (2009), The Maps of Antietam (2012), and The Maps of the Bristoe Station and Mine Run Campaigns (2013). This latest magisterial work breaks down the entire campaign (and all related operational maneuvers) into 24 map sets or “action-sections” enriched with 120 original full-page color maps. These spectacular cartographic creations bore down to the regimental and battery level. 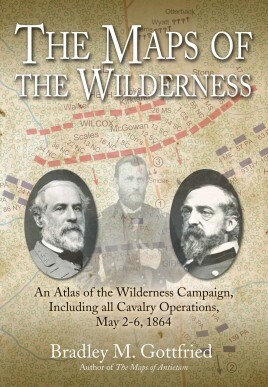 The Maps of the Wilderness includes an assessment of the winter of 1863-1864, the planning for the campaign, the crossing of the Rapidan River, and two days of bloody combat and the day of watchful stalemate thereafter. At least one—and as many as eight—maps accompany each “action-section.” Opposite each map is a full facing page of detailed footnoted text describing the units, personalities, movements, and combat (including quotes from eyewitnesses) depicted on the accompanying map, all of which make the story of the first large-scale combat of 1864 come alive. Each cartographic snapshot also serves to unlock everything ever written on the subject. 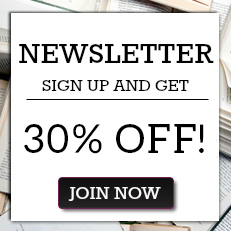 This detailed coverage also includes an order of battle, interview with the author, bibliography, and an index. This original presentation leads readers on a journey through the epic battle that would prove to be the opening salvo in a prolonged fight that would not end until the Confederates surrendered at Appomattox in April 1865. The Wilderness Campaign has two unique characteristics. First, although he did not command the Army of the Potomac, the battle was Ulysses S. Grant’s first against General Robert E. Lee. Second, the Wilderness fighting—prolonged, bloody, and inconclusive—is widely viewed as the most confusing action of the entire war. The dense thickets and deep smoke obscured much of what occurred during the two days of combat. Gottfried’s book cuts through the confusion to deliver a clear account of the horrendous struggle. Perfect for the easy chair or for walking hallowed ground, The Maps of the Wilderness is a seminal work that, like his earlier studies, belongs on the bookshelf of every serious and casual student of the Civil War, or in the hands of an avid enthusiast out walking the Hallowed Ground. Dr. Bradley M. Gottfried holds a Ph.D. in Zoology from Miami University. He has worked in higher education for more than three decades as a faculty member and administrator. He is currently President of the College of Southern Maryland. Gettysburg Kids Who Did the Impossible!